All we can say is awwwwwwe. In our opinion, this throw-it-on-a-plate approach to presentation is appalling. Why the green in the sauce? why the wilting food? Why the over-cooked tortilla? Did we do something to deserve this? 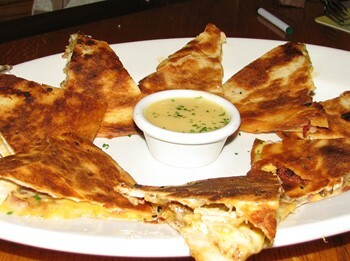 Honey mustard sauce sweetens the quesadilla dish. Yeah, the sauce was fine. We're being picky about the parsley that is sprinkled around the plate being put in the honey mustard sauce. That doesn't look appetizing at allllllllll. 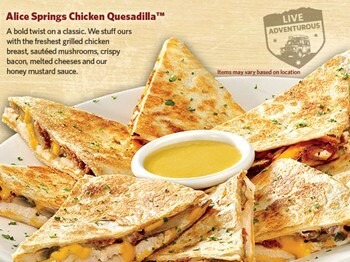 Did you know that it has 1,494 calories, 89 grams fat (42 g saturated)and 2,875 mg sodium? Oh my goodness..and it's only an appetizer!